Tennyson Inlet is an arm of Pelorus Sound. The settlement of Duncan Bay is reached by a winding 32-kilometre road over the Ōpouri Saddle from Rai Valley. In this satellite view Duncan Bay is at bottom centre and Penzance Bay on the inlet to its west (left). Elaine Bay, which is reached from the road to French Pass, is further up the image. 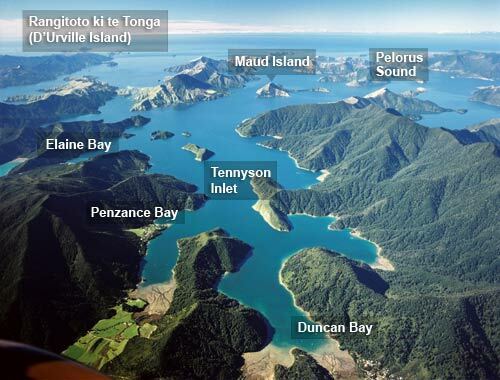 Maud Island (Te Hoiere) is in the Tāwhitinui Reach, the part of Pelorus Sound where Tennyson Inlet joins the main channel. Rangitoto ki te Tonga (D’Urville Island) is at the far top left of the image.